Dubbed the “Ultimate Emerald-Cut Diamond” the 100.20 carat D color internally flawless emerald-cut diamond will go up for auction at Sotheby’s, come April 21, 2015. The remarkably large stone originated from a rough diamond weighing over 200 carats, found in southern Africa by De Beers. It took the owner over a year to cut and polish the diamond until it was deemed perfect. The extremely large diamond possesses a very high level of clarity and color purity, bringing up the comparison of a pool of icy water. A diamond may be a diamond after all, but there are various levels of quality and value, ultimately determined by the 4 Cs: color, cut, clarity, and carat. In colorless diamonds, such as the Ultimate Emerald-Cut Diamond, all four categories are of utmost importance. Not only is this diamond unusually large, it is especially big for a stone in the IF category. Internally flawless, which refers to the level of the stone’s clarity, is the second to highest clarity level. Flawless is the only clarity category above IF diamonds, and very few of such diamonds are known to exist. 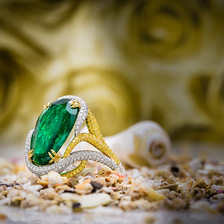 Furthermore, this emerald-cut stone displays a D color. This represents the level in which color is found in the stone. Fancy Color Diamonds are all about the color. In fact, the more the color is seen the better. However, colorless diamonds work differently. The lack of color is what is significant. The color grading scale for colorless diamonds uses the letters D through Z. This means that the D grade is the absolute highest. So far, out of the four categories, one is the second to highest and the other is the highest. We’ve already mentioned how in terms of carat size, 100 carats is pretty huge. The fact that it came from a rough diamond of 200 carats and that it took a year to polish indicates that the owners have taken a lot of love and care to make this diamond as perfect and beautiful as possible. That makes three categories with record-breaking stats. Finally, we have cut. There are better cuts and worse cuts, but much of the type of cut depends greatly on the type of stone. 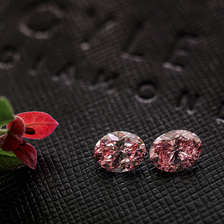 In Fancy Color Diamonds, the cut should bring out the color. The brilliant round cut, a very popular cut for colorless diamonds, is avoided, because it does not add to the diamond’s color. Though quite rare, the Ultimate Emerald-Cut Diamond is not the only D color diamond of 100 carats and over to have been put up for auction. 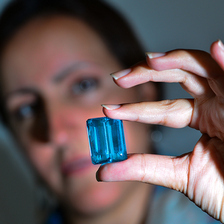 In 2013, not one, but two flawless D diamonds over 100 carats sold at auction. The first brought in $262,830 per carat whereas the second sold for $258,708 per carat. This exceptionally large stone will be showcased in several locations including Dubai, Los Angeles, Hong Kong, London, Doha, and New York between March 16th and April 21. We are very interested to see how much money this diamond will bring in at auction in April – will it break the records of 2013? Let us know what you think!